At the river cross of Kahajan and Rungan River, the ship turned around. Therein lies this historical site. Tajahan is a sacred location which highly purified by the Dayak tribe, especially they who belief Kaharingan. 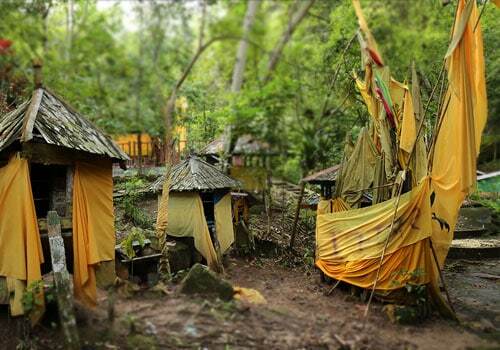 If you have a desire, the Dayak people usually put a yellow cloth and offerings in tajahan. Supposedly, this tajahan has frequented by national hero from Central Kalimantan named Tjilik Riwut. You will also found six mini home contents some eggs and bones for the offering around Tajahan. From the top deck of the ship, you can more freely enjoy the scenery along the river that divides Palangkaraya. The ships crept back under Kahayan bridge. The next route is to enjoy a village over the river. The local people call it as Lanting home. Floating house only sustained a few logs. Not only as a residential, the residents also use it as their "yard" for their fishpond of freshwater fish or use it as kiosk with various types of merchandise.